A first person animal encounter write-up that will be updated each month, and includes amazing critters and underwater photography tips. Welcome to Mike Bartick’s Water Column, a first person animal encounter write-up that will be updated each month. I'll discuss my latest obsessions from the oceanic rainforests of the world. Get up close and personal with some 'Holy Grail' critters and chat about animal behavior. My observations and quips are backed by research, but are from a naturalist’s point of view. Join me as I travel through our planet's water column. Now let's go and have an adventure! Obsession is a funny thing and divers can get it pretty bad. Add in a diver with a camera, and now we have a whole new world of obsession. For me, every expenditure seems to be measured against my newest lens or modeling light. The cost of a new strobe is acceptable, whereas basic maintenance on my car can be a stretch. Diopters are doable, although tires can wait. And when it comes to critters, that obsession works on me without mercy, sometimes quickly, sometimes slowly, but it’s always inevitable until I finally have that critter square in my lens. 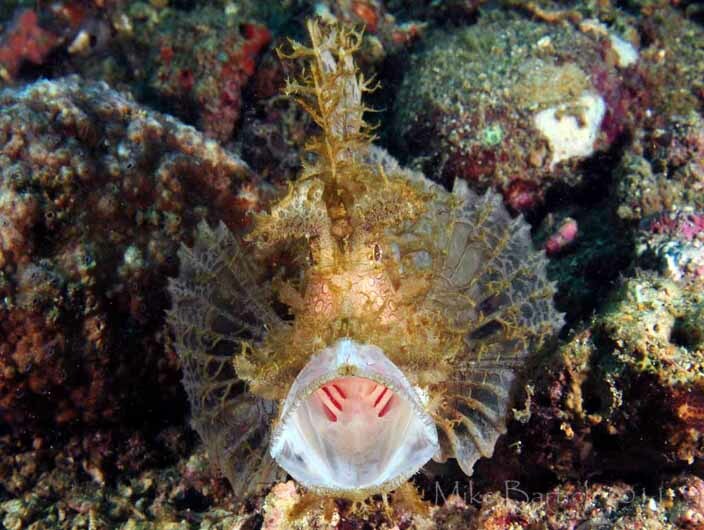 Several years ago I heard the term 'holy grail' applied to marine wildlife, which In-turn led me to think about my current 'holy grail' for critters. Since then my list has changed several times over and continuously evolves, vacillating between animals and specific animal behavior. 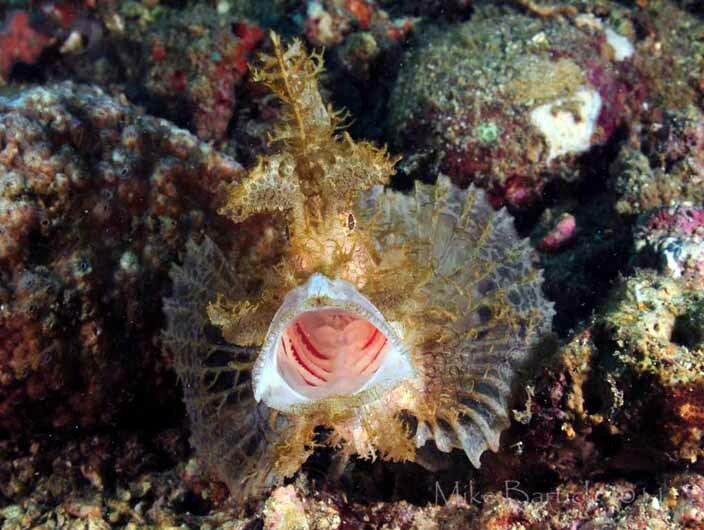 Recently while visiting my current favorite critter locale Anilao, Philippines, a guest asked me about a particular animal that she had spotted on a previous dive. With her best English, she enunciated through a heavy German accent, "I think I found a 'Wiolet Wionfish'." I thought about what she was trying to tell me for a minute, deciphering the words. A lionfish, hmm…they are a lovely creature indeed but a violet one? 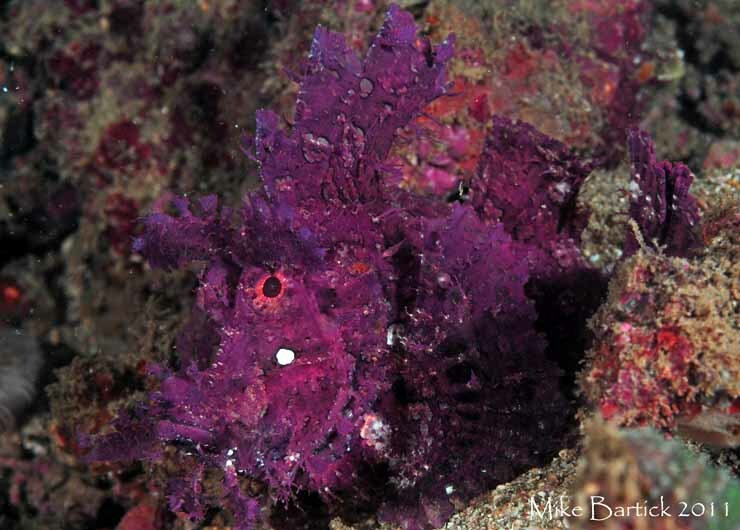 I have seen many very colorful lionfish in my day but not violet...and that’s when it happened. The spinning wheels in my head searched the memory banks for violet critters….then all at once like slamming on the brakes, it suddenly became crystal clear. Perhaps she stumbled upon an extremely coveted and photogenic critter. 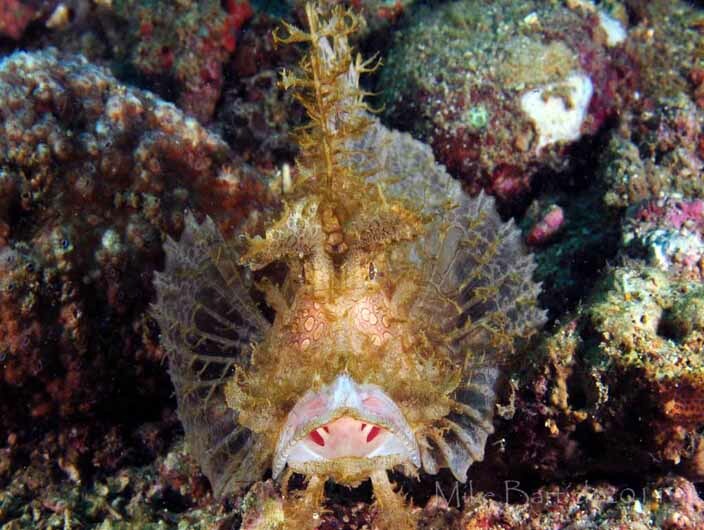 A creature so amazing that divers have spent their entire dive careers traveling the globe for the chance of seeing one! "A Violet Lionfish,” I said, "can I have a look at your LCD?" Straining to see through the back of her compact camera housing, the glowing distortion of her LCD was made worse by water droplets. But as my eyes adjusted, my suspicions were confirmed, and now became an overwhelming reality. The LCD glowed with the one of a kind image of a deep purple Rhinopias frondosa. Instantly my anticipation peeked and the obsession began to purr. Purple Lacy Rhinopias, Rhinopias aphanes. We returned to the site to look for this special critter, amazing that I have dived this spot on numerous occasions, usually deep looking for unusual nudibranchs, and have never seen one here. But when I saw the photo, it all made sense. Since that fateful morning several more Rhinopias have been discovered in the immediate area. 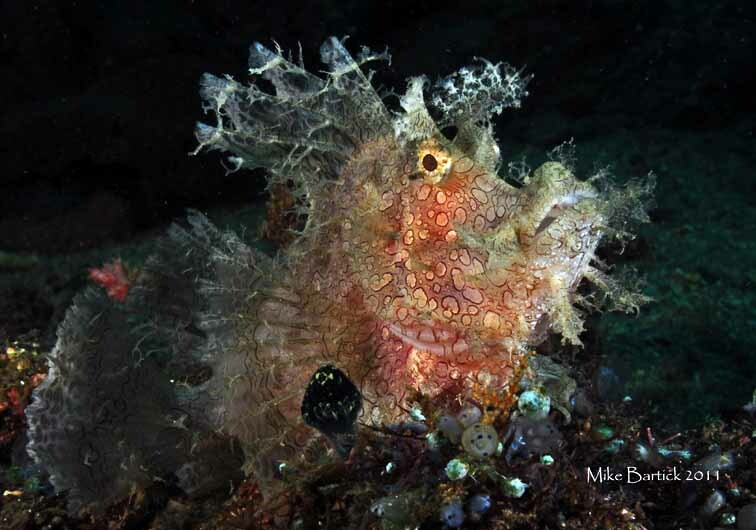 My e-mail box has been filled almost daily with photos of Rhinopias, late night phone calls and discussions have ensued and continuous contact with local dive guides have enabled me to keep close tabs on the quickly evolving frenzy. Since then our tiny little macro haven has been rocketed into a fourth dimension of Rhinopias fever. 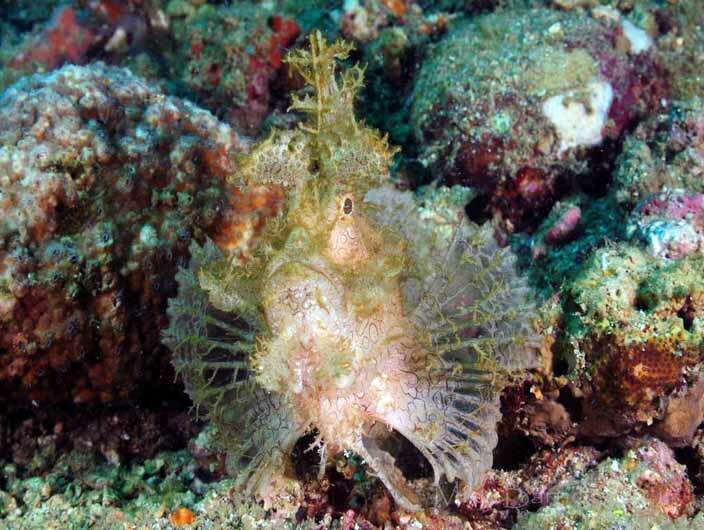 Rhinopias are Scorpionfish that come in three flavors, the frondosa, aphanes, and the eschmeyeri. Each ranging in coloration, pattern, and size. 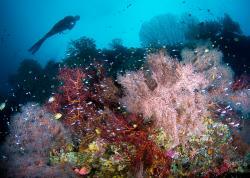 They are a widespread Indo-Pacific animal that have sporadic sightings by divers. Speculation comes from academia which now thinks that the frondosa and the aphanes may be interbreeding. If so, this would nullify one of these two groups all together. Leading scientists speculate that one of these two are not a true species. Nevertheless, the Rhinopias hold a top slot on the 'Holy Grail' list of critters. 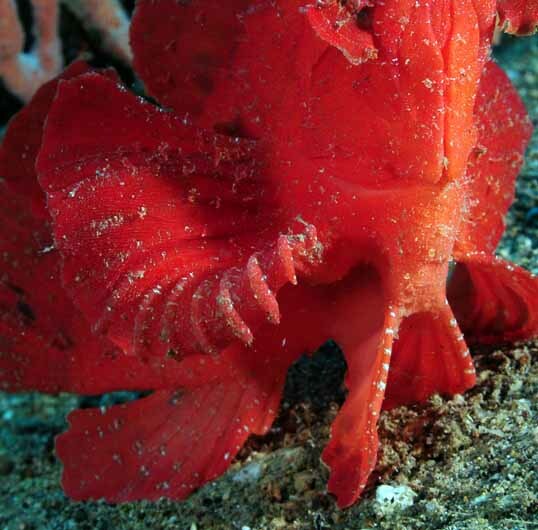 The Rhinopias is a benthic animal spending its entire life on the substrate. It has developed particular characteristics that enhance its charm and enable it to survive, so let’s take look at a few of them. The aphanes' or frondosa’s camouflage is perhaps the number one feature and reason that so many naturalists are driven to see them, and depending on the particular fish, each individual’s appearance will vary. They are covered with skin tags or elaborate frondosa that mimics the algae or soft coral and crinoids of its immediate surroundings. The base coloration is maze-like, striped, or blotchy. But both always have the tell-tale white spots under each eye. This is a common decoy eye that enables the predator to watch the prey, without detection. 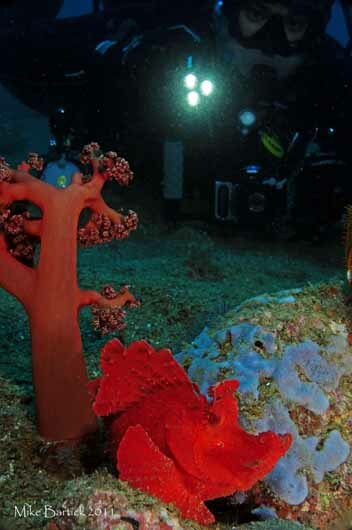 They can be found in rather shallow waters ranging from 10 feet to 50 feet, living amongst soft coral and algae, broken rubble, and sandy patches. Rhinopias eschmeyeri are perhaps the opposite of their kin. These guys are a deeper dwelling animal residing in the 65-80 foot range. Often a drab brown when found, but with proper lighting they can vary from bright yellow, pink, red and orange and sometimes saddled in pattern and coloration. The skin tissue is smooth and covered with small skin tags. They dwell on seaward slopes and are often found in the open. The eschmeyeri are highlighted by the eyebrows or paddle flaps, giving them a 'Groucho Marx' appeal. All have a hooked style nose, a narrow face with the eyes close together and at the top-front of the face. 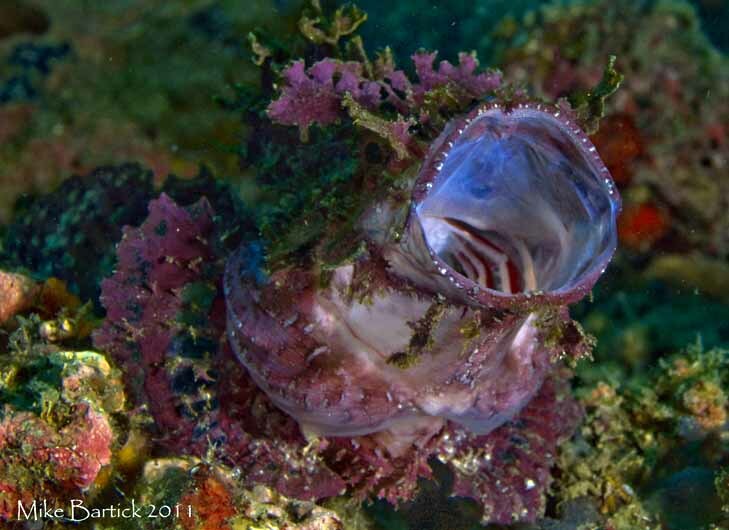 Like other benthic dwellers, the Rhinopias molt their skin tissue to rid themselves of parasites or algae growth. The Rhinopias are at the top of the chart in more ways than one. Once surviving the larval stage from cannibalistic siblings and hungry reef fish, the Rhinopias grows into a benthic apex predator. 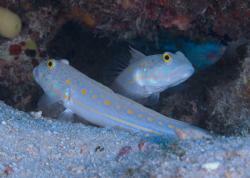 With no other reef fish willing enough to consume them, they parade themselves around with daring impunity. Photo showing an up-close view of the Rhinopias eschmeyeri "claw." Rhinopias are a lie and wait predator that ambushes their prey by using a combination of camouflage and movements. The first few spines of the lateral fins have evolved into articulating toes if you will. These toes or "claw" helps them to hook into the substrate and pull themselves along. This is all part of the hiding and hunting façade as seen in other bottom-dwellers. By flopping about the bottom, other fish will discount the movements as flotsam or perhaps a wounded fish and come in close to investigate. The two white decoy spots below the eyes are distracting enough to mislead the prey. And as the unsuspecting fish approaches to investigate, the Rhinopias carefully watches, gauges the distance, and then all at once, the Rhinopias' jaw drops and inhales the fish. Rhinopias are "gape feeders" which may explain part of its behavior. The mouth opens and the jaws gape forward. The opening is so quick that it actually pulls in a mass of water, creating an extremely strong vacuum, therefore making it impossible for the intended prey to escape, usually reef fish. "I've found a Rhinopias. Now what?" Portrait photos are a great way to catch striking images of these ornate creatures. Look for contrasting backgrounds to make your subject "pop." Use your imagination with lighting. Positioning your modeling light off-camera can lend some nice drama to the shot. Incorporating a model can lend a whole new aspect to the shot as well. Working the shot with a dive buddy can often yield some great fun photos, so be sure to keep your head in the game and get creative. Read more about photographing behavior. 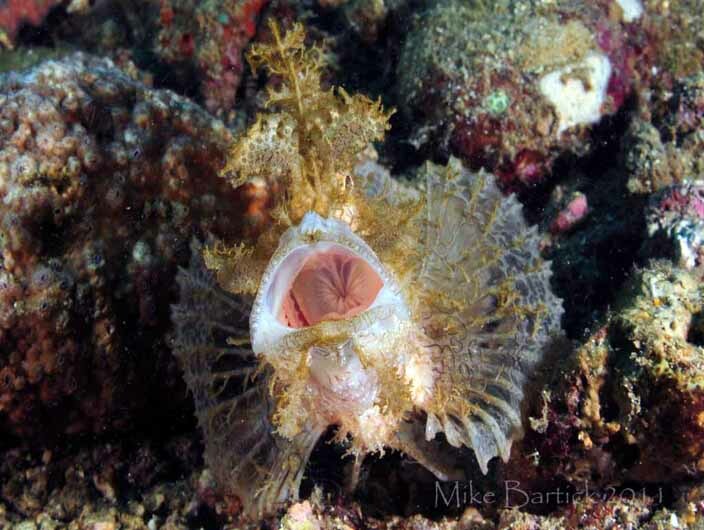 Like frogfish, another "gape feeder," the coveted shot seems to be the yawning behavior photo. Photographers have been known to camp out waiting for the photo op which occurs randomly and without notice. Is it stress that causes them to yawn? Are they creating a better seal for the strike? Perhaps we will never know the exact reason, but to watch one open up and yawn is too cool and really fun to photograph. Yawn sequence of a Rhinopias frondosa. Sometimes luck is in the cards and sometimes not. Mother Nature loves to play tricks on me, like when I look away. My wandering eye returns to the last frame of the yawn, or at other times, I'm out of bottom time and begin backing away, too far for strobes to reach. Anticipate the shot by setting your camera up during the approach. 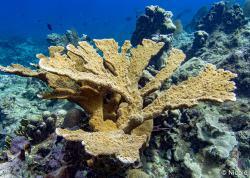 I often do this by bracketing a few frames (aka test shots) on a piece of coral or anything near-by. A deeper F-stop (higher number aperture) will require more strobe power, but will yield a better color profile. If your subject is shallow then you will need a lot of strobe power to sharpen and colorize your photos. Focus and lock on your award winning subject, re-focus every few seconds and re-lock. Achieving fast focus is key. Once your Rhinopias begins to yawn, there won't be anytime for autofocus and you will once again, miss the shot. There is nothing more frustrating then to see your subject blur through the viewfinder as the action begins, then sharpen once it ends. Another benefit of focus-lock is compulsory strobe flash. This isn’t the case with compact shooters but turning the strobe power down will help the recycling speeds. Shooting the entire yawn series isn’t requirement either. A single well lit photo says it all, and being ready for it makes all the difference. 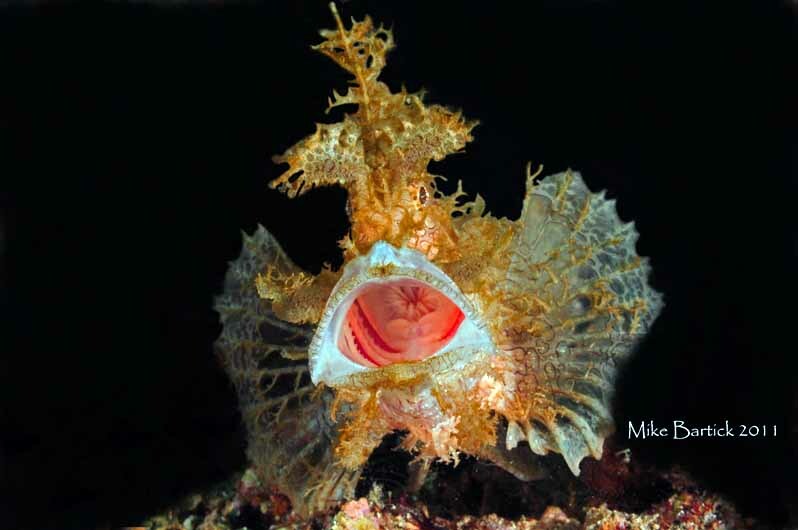 Stay tuned for next month's installment as I go after the flat faced frogfish of Ambon. 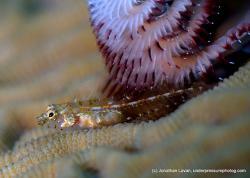 Be sure to join the UWPG Anilao Photo Workshop in April / May 2012! Submitted by Anonymous on Fri, 2011-10-28 06:25. 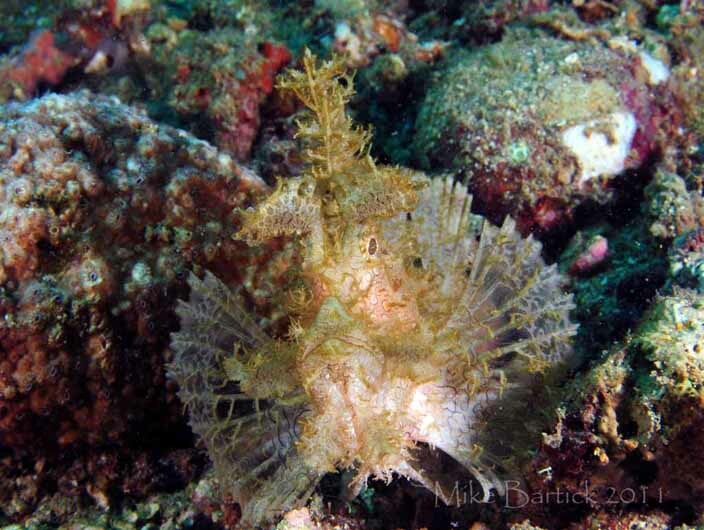 I have been trying to find these guys for years and have even looked in Anilao and not even a glimpse. Fantastic photography! Submitted by Anonymous on Wed, 2011-10-19 21:58. Great article and pix, as we've come to expect from your camera! Submitted by DavidH on Mon, 2011-10-17 07:34. Oh my goodness. The creatures of the sea that you are capturing in these photo are amazing looking. I am sure though, that they might not be as harmless as they look. This is amazing. The staff and the house advantage is available via chat anytime you are having issues or as a new gambler may be confused about something in the game. Will be in Dumaguete in Dec. Submitted by smb2 on Sun, 2011-10-09 20:22. Will be in Dumaguete in Dec. Can't wait. Thanks for the great article. Submitted by Anonymous on Sat, 2011-10-08 23:08.